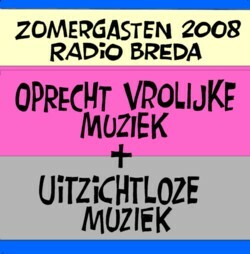 This week I am going to record another episode of the yearly radio show that I do with Marthy Coumans for Radio Breda. Actually we are going to record two shows this year. This year’s theme’s are ”uitzichtloze muziek” and ”oprechte vrolijke muziek” . Marthy has begun sending me e-mails in which he blames me for choosing these ridiculous themes, but you can be sure that it was he who did it. Translated they mean something like ”complete hopelss” and ”genuine cheerful” . I have been listening to a lot of songs in the past few days, but I still haven’t found enough music for tomorrow. Usually we can both only play eight or nine songs, because we talk a lot and fade out the songs after two minutes. But to be sure that we have enough, I always take some extra songs with me. They still have a record player in the studio of Radio Breda(at least they had one last year), but only one, and Marthy usually comes with vinyl only, so I make a CD of the songs that I choose. Not all my songs are from vinyl; I just use everything that I can find. This year I even recorded something from YouTube. It turned out that genuine cheerful songs were much harder to find than complete hopeless songs. Here is Claude Cloud with a ”One bone” , a song that makes me cheerful every time I hear it. But it this what Marthy means with ”genuine cheerfull” ?! ?